Two weeks ago, as I was getting ready to take off for Palo Alto, Calif., to cover a conference on the importance of energy and infrastructure for the next American economy, The Times’s Keith Bradsher was writing from Tianjin, China, about how the Chinese were sprinting past everybody else in the world, including the United States, in the race to develop clean energy. This notion that we’re in a race with China to see who can develop solar panels and wind turbines the fastest isn’t really accurate. 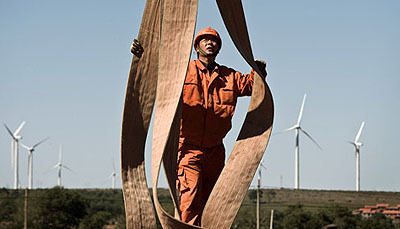 If China zooms ahead and figures out how to make really cheap wind turbines, that doesn’t hurt anyone — it just makes the enormous task of cutting global carbon emissions that much easier. I don’t dispute political merit, tho I’m not convinced it will work…..
What sayeth the hive mind? As near as I can tell, Brad is almost certainly right on the merits. If China produces lots of green tech, that’s good for everyone. Sure, it would be nice if this stuff were made in the U.S. by U.S workers, but the competitiveness of American manufacturing vs. Chinese manufacturing goes way deeper than solar panels, and in the short to medium term there’s probably not a lot that’s going to change our relative advantages in this area. But — is Dave right about the political merits of the “race” metaphor? I haven’t made up my mind on this, but I’ve lately become more receptive to the idea that, for better or worse, the only way to get Americans to take this stuff seriously is to kick it old school and start hauling out that old time Cold War evangelism. Frame green tech as a matter of vital economic and national security superiority over the Reds and quit worrying overmuch about whether that’s really technically accurate. Just figure that it’s close enough, it’s language everyone understands, and it’ll do a better job of motivating development than a couple hundred more PowerPoints about receding glaciers. This is pretty much how Sen. Lindsey Graham (R–SC) does it, though he talks more about “energy independence” than about a green race with China. But those are just two sides of the same coin, and if one works then so does the other. But will it work? On the one hand, Graham obviously has a better feel for how to talk to centrists and conservatives than we lefties do. On the other hand, so far he doesn’t seem to be much making headway with them. But it’s worth thinking about. Arguing endlessly with Sean Hannity and James Inhofe about whether or not snowstorms are evidence of global warming sure doesn’t seem to be getting us very far. Maybe it’s time for a rethink.